AgenoCRM, Any.do, Asana, Assembla, Axosoft, Backlog.jp, BamBam, Basecamp, Bitbucket, Bitrix24, Breeze, Bugzilla, CapsuleCRM, ClickUp, Cloudes.me, Clubhouse, Codeable, Codebase, Countersoft Gemini, Desk.com, DevDocs, Doit.im, DokuWiki, Draftin, Drupal, eProject.me, Esa, Eventum, Evernote, Exana, Feedly, Flow, FogBugz, Freshdesk, Gingko, Github, Gitlab, Gogs, Google Calendar, Google Docs, Google Inbox, Google Keep, Google Mail, GQueue, Habitica, Help Scout, Husky Marketing Planner, Intercom, JIRA, Kanbanery, KhanAcademy, LiquidPlanner, MantisHub, MeisterTask, miniCRM.pl, Newsletter2Go, Nozbe, OnlyOffice, Onshape, OpenProject, osTicket, Overv, PagerDuty, Phabricator, Pivotal Tracker, Planbox, Podio, Producteev, Protonmail, RallyDev, Redbooth, Redmine, Remember The Milk, Rindle, Rollbar, Salesforce, Sentry, SherpaDesk, Slack, SmartBoard, SourceLair, Spidergap, Sprintly, Stifer, Taiga, TargetProcess, Teamleader, TeamWeek, Teamwork.com, TestRail, TickTick, Todoist, Toodledo, Trac, Trello, Unfuddle, VisualStudioOnline (TFS), Waffle, WordPress, Workfront, Worksection, Wrike, Wunderlist, Xero, YouTrack, Zendesk, Zoho Books, Zube. Open Toggl Button inside the Firefox Add-on Store. Click the button next to the address bar and log in with your Toggl account. That’s it, now look for “Start timer” in your favorite tools on the web and track your time. Once you install the add-on, a Toggl icon will be added to the right of the address bar. When the button is grey with a red “x” it means you are currently not logged in. When the button is plain grey it means you are not currently tracking time. When the button is red it means there is a time entry currently running. Click on the Toggl Button to reveal timer’s drop down. Here you can check your current time entry, change settings, sync, log out or stop your timer. Click on the current Time Entry to open a popup that allows you to change the description, assign Tags and a Project to your Time Entry. When you select Projects and Tags you can easily filter them. During Tag selection, the Tags already selected will be highlighted in green. When the timer is not running, you can choose to continue the latest timer started from the extension. You can start a new Time Entry by clicking the link and it will copy the description of the item next to it. Depending on the tool you’re using, the location of the “Start timer” icon will vary. You’ll likely find it within your tasks, issues, cards, to-dos, etc. You can see a few examples of where you can find the link here. You can start a new Toggl Time Entry from any text on the web by selecting it and then clicking “Start timer with description” in the right-click menu. Default project – automatically assign a certain project to all time entries. Show button in right click menu – start a timer from any text on the web. Start / stop automatically – starting your browser will start a new timer or stop the previously running one. Show post-start popup – a popup will appear after you start a time entry where you can edit the time entry you just started. Live updates – instead of periodically synchronizing with the server, the Toggl Button will keep data up-to-date live. Remind me to track – Toggl Button will remind you to track your time on workdays if you haven’t recorded any time for a while. Stop automatically at the end of the day – the currently running timer will be stopped automatically at the time you set as the end of your workday. 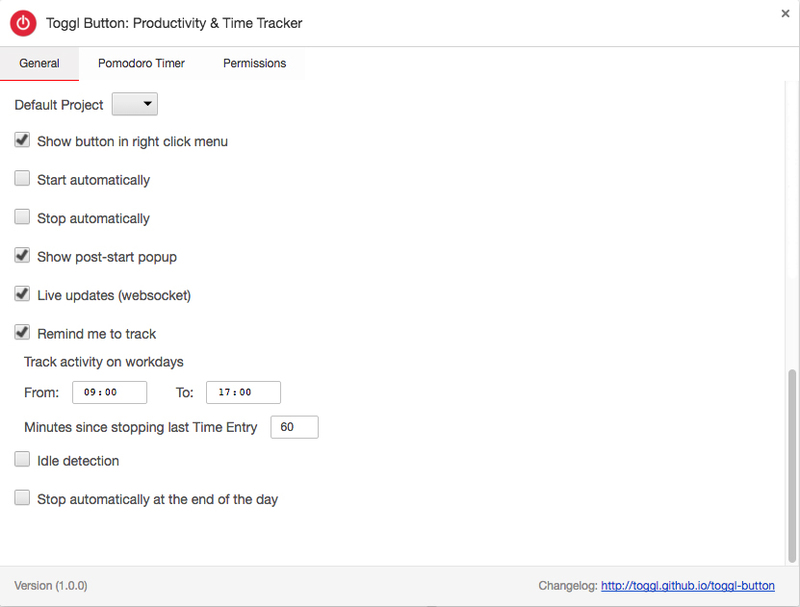 You can choose to automatically stop the running timer when the pomodoro period ends. You can also choose to have a sound notify you and you can set how loud you want that to be. When the time is up a notification pops up to let you know you’ve done well and deserve to take a break. Once you’re done with your break you can select to continue the last entry or start a new one. Clicking the close icon in the corner will keep the idle time and let the time entry continue. Clicking “Discard idle time” will stop the time entry and remove the idle time from it. Selecting “Discard idle and continue” will remove the idle time from the entry but continue tracking. How Can I Get My Favorite Tool Added? 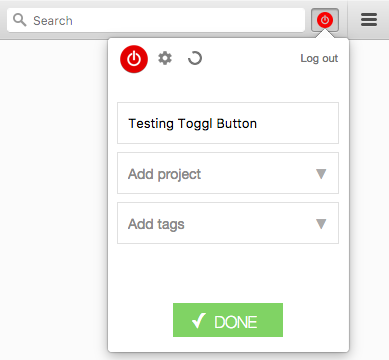 You can also drop us a line at support@toggl.com and tell us about the tool you want integrated with the Toggl Button. If you didn't find what you were looking for, please write to support@toggl.com and we are happy to help!